With all of the public interest and media attention surrounding the arrival of our Mirage IV, it is very easy to overlook the ongoing work by our Museum Engineering teams as they continue to maintain, restore and refurbish our considerable aircraft collection. Very often, restoration and engineering work consists of a lot of hard work with little visible evidence of progress to the naked eye. Whilst repainting an aircraft is perhaps the most visibly rewarding part, the restoration process that gets us to that point is very important. So here is an overview, in no particular order, of some of the work that our team of volunteers have been undertaking during the winter months. All of our live aircraft have had overhaul work completed throughout the winter. The volunteer teams from both the Nimrod and Victor crews have been busy on a regular basis performing routine maintenance tasks that these jets needed when in service with the Royal Air Force to keep them performing well. With access to the Elvington runway now in place for this August’s Rolling Thunder Day, they are working harder than ever to make sure our live jets are in great shape. Buccaneer XN974 is receiving a final touch-up following re-painting in her spectacular, original Navy scheme. Now painted exactly as she was when delivered back in 1964 for aircraft carrier trails work, this magnificent paint scheme really catches visitors attention and will certainly make XN974 one of the stars of our Thunder Days this summer. Over the winter, our engineering team worked on a whole series of technical issues to bring the jet up to the point where she was ready to start. In February, her first start in more than two years was accomplished without a hitch and she is now ready to rejoin our live aircraft fleet. The tiny Eastchurch Kitten has been fitted with new brakes to enable taxiing. While we have taxied the Kitten on previous occasions, it has only been possible with the assistance of some athletic wing tip handlers. After testing the new independent braking system, we hope that our Kitten will be able to taxi far more reliably and in greater safety than previously. Our Meteor NF14 has been progressing very well over the winter. This is one of those projects where a lot of hard work is being done under the surface by Graham Buckle’s team of volunteers. The objective is to take the Meteor’s restoration as far as it is possible to go. 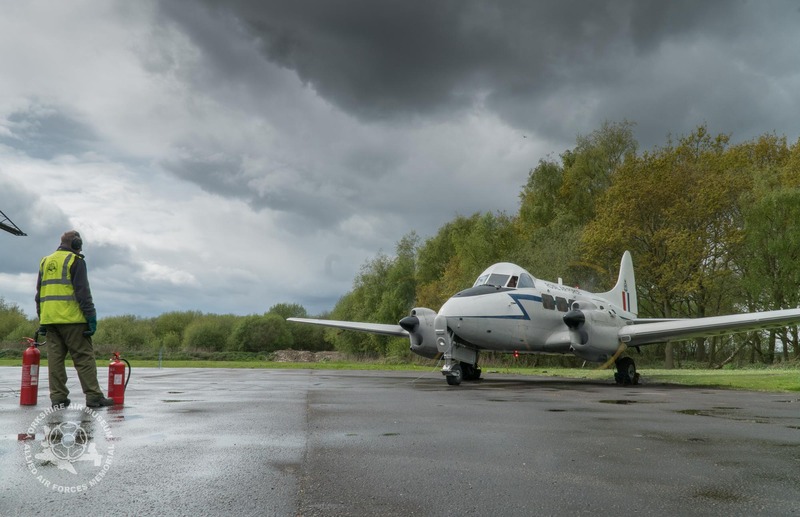 Rather than simply apply a fresh paint scheme, the team have been busy refurbishing and restoring the aircraft internally and have also tracked down various useful components to enable operation of her flight controls and other systems. A pair of jet engines may be some way off, but of the team have their way, it won’t be out of the question one day. The Museum’s 1914 BE2 was created by Royal Air Force apprentices at RAF Halton some years ago. As an early canvas aircraft, she is showing the test of time, therefore our Heritage Engineering team are completely restoring the aircraft with a replacement frame. This project is expected to take around twelve months, making her ready for display next summer. Following on from the striking work achieved on our Buccaneer, next aircraft for a repaint is the Hawker Harrier GR3. She has been with us since 2000, so is due for some attention by our team. It is expected that the original aircraft paint scheme will be retained, showing her as she was when flying with the Royal Air Force. Once the Harrier repaint is complete, the next aircraft will be our Tornado GR1. Our Hunter F8 has also been making slow but steady progress to be repainted in her original Jordanian Air Force colours. We will keep you updated on this project, but hope to have her completed before the winter. DH Sea Devon engine reliability has always been a frustrating area for our engineers. However, winter work on installing fresh wiring harnesses on both engines have finally eliminated her reluctance to start and on all tests so far this year, she has behaved impeccably, the straight six engines running more smoothly than ever. Many people have asked if the De Havilland Mosquito engines will ever run live. Much work has been done by Tony Agar’s team to enable this to happen. Presently, the Museum is awaiting a professional stability report prior to obtaining insurance clearance to test engines. When we have the results of this, we can move forward to the next stage. If you have been following the progress of our Mirage IV project, you will know that she is now here at the Museum. All of the major assembly is complete and our team are now cleaning the aircraft and adding the multiple inspection covers and fairings to complete the process. We will be enjoying an official handover ceremony this summer, but meanwhile the Mirage IV can be seen in our main hangar. If you’ve visited the Museum this season, you will have seen our English Electric Canberra T4 sitting with the noise high in the air. This is to enable our engineers to have easy access to the tail, which required restoration and reconstruction work prior to a full re-paint in 2017. The leading edge of the tail fin is actually made from wood to accommodate an internal antenna and out is this area that is being worked on right now. Nose high position of the Canberra allows our engineers access to the tail fin. Many people ask if our Fairey Gannet AEW 5 will ever run live. While her Twin Mamba engine layout may be unusual, it is no more complex than our other aircraft. Presently, we are awaiting engine removal tools from Yeovilton. Once they are available, we can work towards a new engine fit and progress towards some live engine runs. English Electric Lightning – This aircraft is privately owned and only minor refurbishment is allowed by owner. Our team gave her a thorough scrub last month and she is now looking much better. Additionally, we have accessed the cockpit to check on the state of the interior and it is great to see that she is actually in great shape internally. With a collection of more than forty exhibits, our team of volunteer engineers and heritage staff have a never ending task. As we complete the work on one exhibit there will always be another project on the horizon that will be in the planning stage and need their expert care and attention. If ever you visit the Museum and an aircraft appears to be dismantled or with access hatches removed, the chances are that deep inside the aircraft, there is an aircraft engineer hard at work scraping his knuckles and trying not to drop that spanner into a hard to reach location. Give them a call and ask about their work, they are always happy to chat.